There isn’t an exact definition of a massive rotator cuff tear. Sometimes the severity is expressed by the number of tendons which are torn, sometimes on the size of the tear. Lädermann et al. speak of a rotator cuff tear when at least two tendons are completely torn. Next to the number of tendons which are torn, at least one of the two tendons must be retracted beyond the top of the humeral head. 4. Massive tear: greater than 5 cm. the shoulder girdle reaches a large range of motion. Because of this large range of motion, the shoulder girdle is less stable. The limited passive stability indicates that the primary source of joint stability must be balanced muscle control. The rotator cuff provides this stability. The rotator cuff exists of four muscles: M. Subscapularis, M. Teres Minor, M. Supraspinatus and M. Infraspinatus. During shoulder abduction the rotator cuff muscles act together to stabilize the humeral head within the glenoid in a process known as concavity compression. The rotator cuff muscles contribute to shoulder elevation between 60 and 130 degrees. The Subscapularis muscle makes sure that internal humeral rotation is possible. M. infraspinatus and M. teres minor primarily provide external humeral rotation. All muscles of the rotator cuff, except the M. supraspinatus, ensure that the humeral head stays depressed to balance upward pull of the deltoid early in glenohumeral abduction. Rotator cuff tears are the leading cause of shoulder pain and shoulder-related disability. The pathogenesis of these tears is still partly unknown. Traumatic injury to the rotator cuff can be caused by falling on an outstretched hand, by an unexpected force when pushing or pulling, or during shoulder dislocation. Normal age-related muscle deterioration and excessive repetitive motions are examples of atraumatic causes. There are many other etiologies implicated in the pathogenesis of rotator cuff tears. Extrinsic factors such as subacromial and internal impingement, tensile overload and repetitive stress can lead to a higher risk of rotator cuff tears. Smoking and inflammation of the joint capsule (frozen shoulder) can also lead to a higher risk for a rotator cuff tear. Also, thyroid pathologies could play a role in rotator cuff tear pathology. But this relationship needs more research. Comorbidities of rotator cuff tears are hormone-related gynecologic diseases, autoimmune pathologies, rheumatoid arthritis and type 1 diabetes mellitus. The location of the tear has an important influence on the possible dysfunctions. Individuals with a tear of the supraspinatus may complain of tenderness over the greater tuberosity, pain located in the anterior shoulder and symptoms radiating down the arm. Rotator cuff tears must be differentiated from rotator cuff tendinopathy and from bursitis (subacromial bursitis). Arthrography or ultrasonography can make this distinction. Many factors are considered in diagnosing rotator cuff tears. Subjective history including mechanism of injury, activities that aggravate or ease pain, current limitations to function and physical examination findings. Additionally, diagnostic imaging is used to make the diagnosis. The following list contains commonly used shoulder outcome measures and is not at all complete. Your own clinical judgment will be necessary to determine the most useful measure in your clinical setting. PSS is used to measure outcome of patients with various shoulder disorders. It’s a 100-point questionnaire consisting of 3 subscales: pain, function and satisfaction. This test rates the changes in symptoms, in this case, in the shoulder. It compares the symptoms with those from 12 months earlier. There are 15 possible scores, ranging from -7 (the worst) to +7 (the best). The RC-QOL is a disease-specific outcome measure that evaluates the impact of rotator cuff diseases on the general quality of life. It is a questionnaire with 34 items, divided into 5 domains. - Social and emotional issues. The SPADI is created to measure pain and disabilities associated with shoulder pathology in patients with shoulder pain of musculoskeletal, neurogenic or undetermined origin. There are 2 domains, pain and disability, with 13 items. Pain contains 5 items and activities contain 8 items. Every item is scored on a visual analogue scale, ranging from 0 (no pain/no difficulty) to 10 (the worst pain imaginable/so difficult that help is required). The ASES is used to measure shoulder pain and functional limitations in patients with musculoskeletal complaints. The pain is measured with a visual analogue scale. The self-report part of the measure consists of 2 single-item subscales (pain and function). These are Likert-type scales and are scored from 1 to 10: a higher score indicates a lower pain and greater function. The SST is a function scale with 12 items, used to assess improvement in shoulder function after treatment interventions and to check the patient’s ability to tolerate or perform 12 activities of daily living. The scores range from 0 to 100 and are reported as the percentage of items that were answered. The diagnosis of a rotator cuff tear can be established by a careful history and a structured physical examination. The physical examination should include inspection and palpation, range of motion testing, strength testing and special tests. 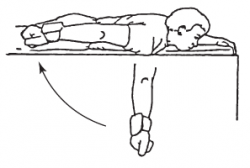 Active and passive range of motions that the clinician needs to test are: forward flexion, abduction and internal/external rotation at 0° and 90°. Rotator cuff tears lead to loss of active range of motion, passive range of motion is often preserved. 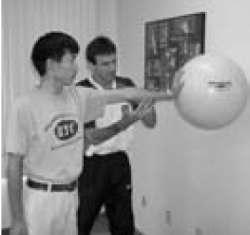 Strength can be tested using a portable hand-held dynamometer. Each motion is predominantly exerted by a specific muscle. We test the external rotation force for the infraspinatus muscle, abduction for the supraspinatus and internal rotation for the subscapularis muscle. Rotator cuff tears often present with shoulder weakness. The examiner must disregard the muscle performance measurement if it is determined that the patient in appropriately used other musculature to complete the task. 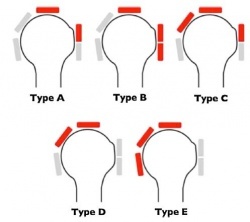 There are many special tests described for examination of the rotator cuff. A few are presented here. A positive test implies that the respective tendon is torn. A test is positive when a position cannot be executed or maintained. To enhance the ability to detect full-thickness rotator cuff tears, a test-item cluster has been developed. A cluster improves the post-test probability for the clinical diagnosis of a full-thickness tear . The results of the physical examination should be put in clinical context with the presentation of the patient and the findings from images. Specific details for the rule may be found in Test Item Cluster- Full-Thickness Rotator Cuff Tear. There are three types of surgical treatments to repair rotator cuff tears. A traditional open surgical incision is often required for large or complex tears. An optical scope and small instruments are inserted through small puncture wounds instead of through a larger incision. The operation can be carried out under visual control via a video display. 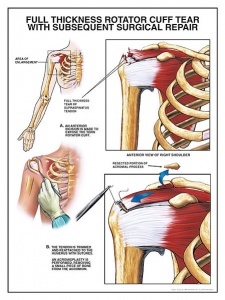 New techniques and instruments allow surgeons to perform a complete recovery of the rotator cuff through a small incision of generally 4 to 6 cm. The operative treatment is done mostly arthroscopically which is less invasive than open/mini-open surgery and leaves only a few small scars. The rehabilitation can start faster and the patient has less pain during recovery. Conservative management is warranted in most rotator cuff injuries. In addition to physical therapy, non-surgical treatment may include non-steroidal anti-inflammatory drugs and steroid injections, time, local rest, application of cold or heat and massage. The judicious use of no more than three to four injections of steroids into the subacromial space or around the biceps tendon can be helpful in the early phase. - Reducing pain and muscle tension in the scapular and neck area in order to promote the motility of the scapula. This to ensure the correct position of the glenoid. The muscles targeted are the M. pectoralis minor, upper trapezius and M. levator scapulae. - Improving the wrong humeral head position in order to restore scapulo-humeral mobility. - Strengthen the muscles that stabilize and move the shoulder, the upper part of the M. serratus anterior and the intact rotator cuff muscles. Both nonoperative rehabilitation and postoperative rehabilitation of the rotator cuff involves the following principles. - There should be no compensatory actions in the upper extremity. - It is advised to quickly use the elbow, forearm and wrist in order to strengthen them. Especially during long immobilization. - Mobilization of the scapulothoracic joint and submaximal strengthening of the scapular stabilizers are indicated. The injured tissues should not be inappropriately stressed or loaded. 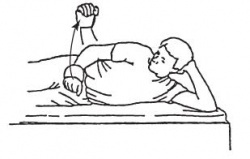 A technique which is used early in the rehabilitation phase is the scapular protraction and retraction resistance exercise. It involves a side-lying position and specific hand placement to resist scapular protraction and retraction without stress applied on the glenohumeral joint. This exercise begins at low resistance. The glenohumeral joint must be in slight abduction and forward flexion during scapular motion. - Posterior capsular mobilization and stretching techniques are often indicated and applied to improve internal rotation ROM. Lie on uninvolved side, with a small pillow between involved arm and body. Keep the elbow of involved arm bent and fixed to side, raise the arm into external rotation. Slowly lower to starting position and repeat. Lie in prone position on a table. The involved arm is hanging straight to the floor. With the thumb pointed outward, raise the arm straight back toward your hip. Slowly lower the arm and repeat. Lie in prone position on a table. The involved arm is hanging straight to the floor. With the thumb pointed outward, raise the arm out to the side, parallel to the floor. Slowly lower your arm and repeat. Lie in prone position on a table. The shoulder is abducted to 90° and the arm is supported on the table. The elbow is bent at 90°. Keep the shoulder and elbow fixed and rotate the arm into external rotation. Slowly lower to starting position and repeat. The therapist applies rhythmic stabilization or perturbation stresses with the patient’s shoulder placed in the scapular plane and 90° of elevation. Late stages of rehabilitation of rotator cuff injury include progressive resistive strengthening, proprioception training and sport-specific exercises. Thrust and non-thrust manipulation (TSTM) of the cervicothoracic spine and/or ribs may lead to significant improvement in pain and disability in patients with a primary complaint of shoulder pain  . The use of TSTM with shoulder patients can be described as the relationship of restoring mobility between adjacent vertebrae. This can be recognized as a reflexogenic mechanism.TSTM can not only be used to improve shoulder mobility but also the overall functional performance. No randomized control trials have found an optimal conservative management of rotator cuff tears. Several studies have shown reduction in pain and disability by treating regions other than the shoulder. Physical therapy has a beneficial effect in the treatment of rotator cuff tears, when it’s part of a treatment program. Goals of the rehabilitation, nonoperative and postoperative, are reducing pain and muscle tension, improving wrong humeral head position, strenghten the stabilizing muscles and regain proprioception and movement automatism. Physical therapy consists of passive and active mobilization and strengthening exercises (open en closed chain). Late stages of rehabilitation of rotator cuff injury include progressive resistive strengthening, proprioception training and sport-specific exercises.